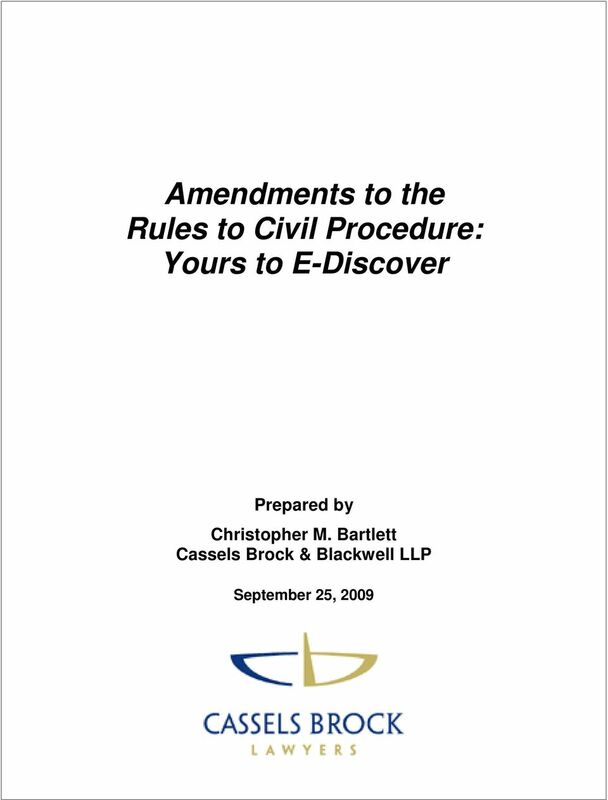 Download "Amendments to the Rules to Civil Procedure: Yours to E-Discover. Prepared by Christopher M. Bartlett Cassels Brock & Blackwell LLP"
3 each case. 5 What may legitimately be required in a multi-million dollar claim in which electronic documents are at the heart of the dispute will likely not be justified in a $150,000 claim in which electronic documents are not as important. The new rules that deal with e-discovery reflect three recurring themes: (i) (ii) (iii) proportionality; flexibility; and cooperation. 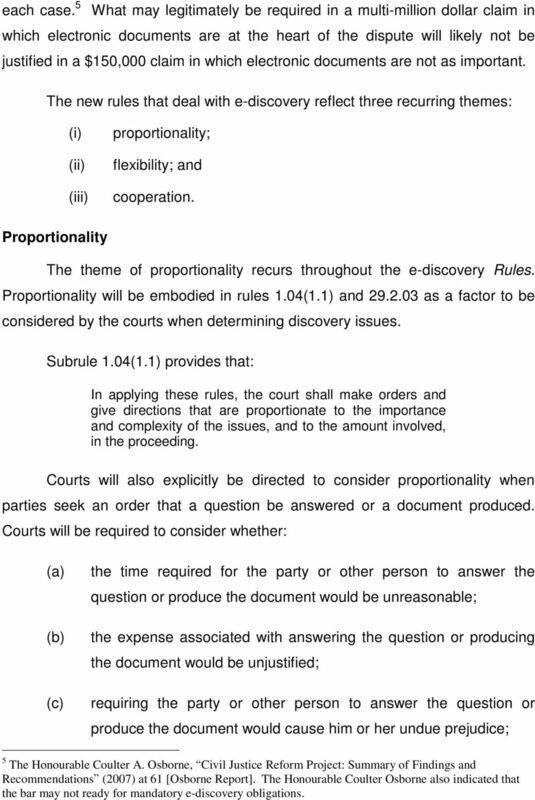 Proportionality The theme of proportionality recurs throughout the e-discovery Rules. Proportionality will be embodied in rules 1.04(1.1) and as a factor to be considered by the courts when determining discovery issues. Subrule 1.04(1.1) provides that: In applying these rules, the court shall make orders and give directions that are proportionate to the importance and complexity of the issues, and to the amount involved, in the proceeding. Courts will also explicitly be directed to consider proportionality when parties seek an order that a question be answered or a document produced. Courts will be required to consider whether: (a) (b) (c) the time required for the party or other person to answer the question or produce the document would be unreasonable; the expense associated with answering the question or producing the document would be unjustified; requiring the party or other person to answer the question or produce the document would cause him or her undue prejudice; 5 The Honourable Coulter A. Osborne, Civil Justice Reform Project: Summary of Findings and Recommendations (2007) at 61 [Osborne Report]. The Honourable Coulter Osborne also indicated that the bar may not ready for mandatory e-discovery obligations. 4 (d) (e) requiring the party or other person to answer the question or produce the document would unduly interfere with the orderly progress of the action; and the information or the document is readily available to the party requesting it from another source. Courts are also to consider whether an order to produce documents would result in a party or other person being required to produce an excessive volume of documents. 6 Relating to vs. Relevant to Proportionality also explains why the scope of documentary discovery will be narrowed by amendments to the Rules. The requirement that parties disclose and produce every document relating to any matter in issue will be replaced by mandated disclosure and production of every document relevant to any matter in issue. Relating to had been interpreted by the courts to require production of any document that has a semblance of relevance. 7 The intention of the amendment is to limit the scope of discovery to a simple test of relevance. The adoption of the relevance test extends beyond e-discovery, but its consequences may be greatest in the context of e-discovery. In most actions, each party has hundreds, if not thousands, of s and other electronic documents in its possession, power and control that would meet the semblance of relevance test. Due to the sheer number of electronic documents, the cost of preserving, reviewing and producing these documents would be exponentially greater than when discovery is limited to hard documents. In contrast to this inflated cost, the marginal benefit to the party receiving disclosure of all electronic documents with a semblance of relevance would often 6 Rule (2). 7 Supra note 5 at 57. 5 be minimal. The substitution of a simple relevance test ensures that each party s discovery costs have some relationship to the benefit derived by the other party. 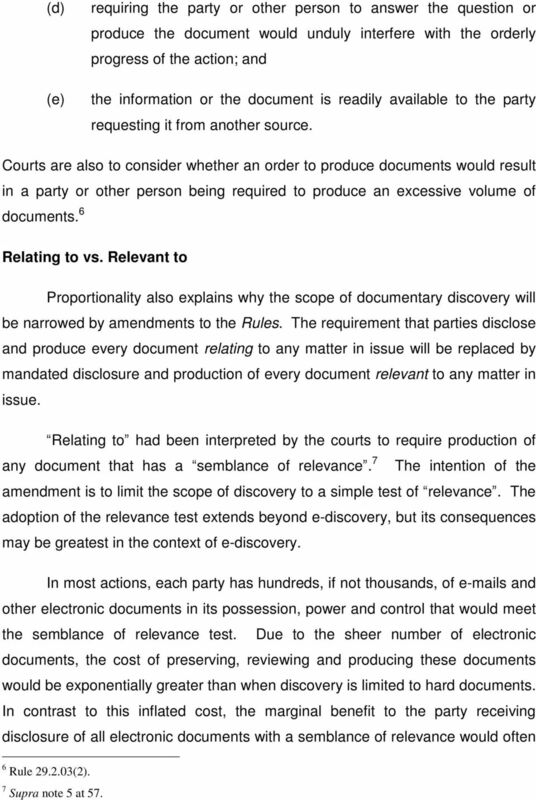 Discovery Plans Consistent with the Osborne Report s recommendation that principles may be more effective than rules in the context of e-discovery, one of the few obligations related to e-discovery imposed on parties and counsel by the amendments to the Rules is the requirement that parties agree to a discovery plan. A discovery plan is a document crafted jointly by the parties (and their counsel) that addresses how they will complete discovery. Parties are to determine the most expeditious and cost-effective means of discovery in the circumstances of the particular case. The purpose of the discovery plan is to minimize discovery issues by encouraging parties to reach an understanding on all aspect of discovery early in the litigation process. 8 Discovery plans are mandatory in every action where there is discovery of any kind, including documentary discovery, examinations for discovery, inspection of property, medical examination, and examination for discovery by written questions. 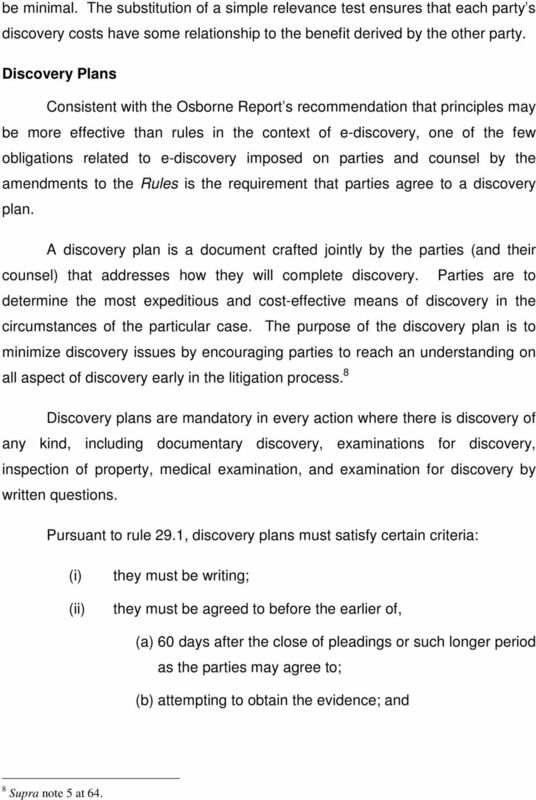 Pursuant to rule 29.1, discovery plans must satisfy certain criteria: (i) (ii) they must be writing; they must be agreed to before the earlier of, (a) 60 days after the close of pleadings or such longer period as the parties may agree to; (b) attempting to obtain the evidence; and 8 Supra note 5 at 64. 6 (iii) they must be updated. 9 However, in keeping with the themes of flexibility and cooperation, the Rules do not set out how the parties are to conduct e-discovery. Rather, they merely set out the areas that the parties are required to discuss and seek agreement. 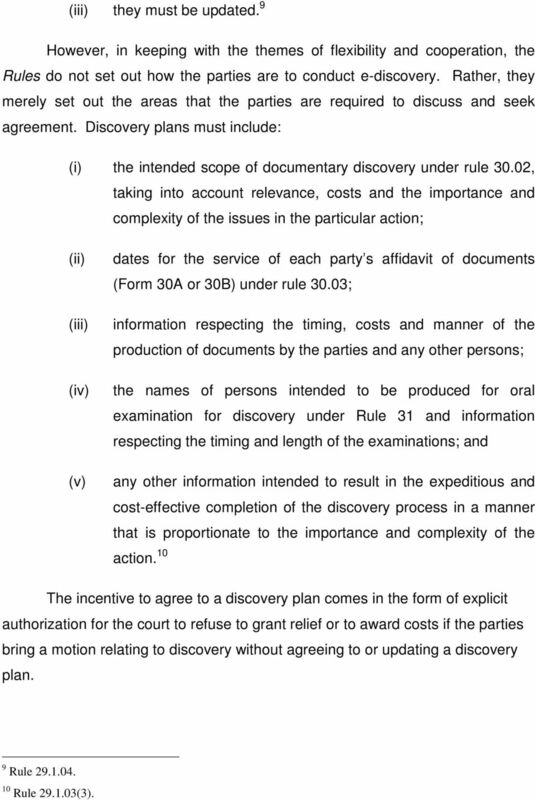 Discovery plans must include: (i) the intended scope of documentary discovery under rule 30.02, taking into account relevance, costs and the importance and complexity of the issues in the particular action; (ii) (iii) (iv) (v) dates for the service of each party s affidavit of documents (Form 30A or 30B) under rule 30.03; information respecting the timing, costs and manner of the production of documents by the parties and any other persons; the names of persons intended to be produced for oral examination for discovery under Rule 31 and information respecting the timing and length of the examinations; and any other information intended to result in the expeditious and cost-effective completion of the discovery process in a manner that is proportionate to the importance and complexity of the action. 10 The incentive to agree to a discovery plan comes in the form of explicit authorization for the court to refuse to grant relief or to award costs if the parties bring a motion relating to discovery without agreeing to or updating a discovery plan. 9 Rule Rule (3). 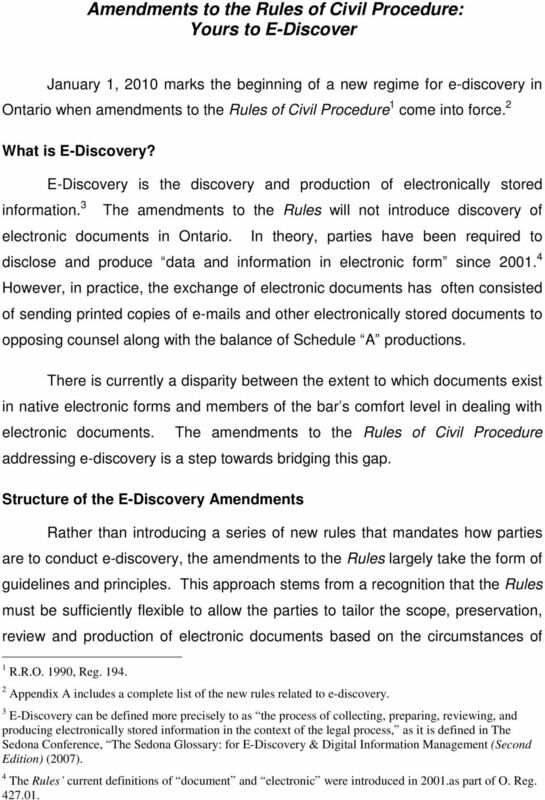 7 The Sedona Canada Principles Addressing Electronic Discovery The parties are required to consult and have regard to The Sedona Canada Principles Addressing Electronic Discovery when preparing the discovery plan. 11 Sedona Canada is a national committee of lawyers, judges, in-house counsel and government representatives that was created in 2007 to establish e- discovery guidelines for all Canadian jurisdictions. 12 In January 2008, it released a final draft of the Sedona Canada Principles Addressing Electronic Discovery (the Sedona Canada Principles ), which were based on national guidelines developed by the Sedona Conference in the United States. There are 12 Sedona Canada Principles that are intended to provide guidance to parties and their counsel on the key e-discovery issues, including the scope, preservation, review and production of electronic documents. 13 Scope Principle 1: Electronically stored information is discoverable. Principle 5: The parties should be prepared to produce relevant electronically stored information that is reasonably accessible in terms of costs and burden. Principle 6: A party should not be required, absent agreement or a court order based on demonstrated need and relevance, to search for or collect deleted or residual electronically stored information. 11 Rule (4). 12 Supra note 5 at The 12 Sedona Canada Principles are set out in full in Appendix B. Sedona Canada has also released commentary in respect of each principle. 8 Preservation/Review Principle 3: As soon as litigation is reasonably anticipated, parties must consider their obligation to take reasonable and good faith steps to preserve potentially relevant electronically stored information. Principle 7: A party may satisfy its obligation to preserve, collect, review and produce electronically stored information in good faith by using electronic tools and processes such as data sampling or searching, or by using selection criteria to collect potentially relevant electronically stored information. Principle 12: The reasonable costs of preserving, collecting and reviewing electronically stored information will generally be borne by the party producing it. In limited circumstances, it may be appropriate for the parties to arrive at a different allocation of costs on an interim basis, by either agreement or court order. Production Principle 8: Parties should agree as early as possible in the litigation process on the format in which electronically stored information will be produced. Parties should also agree on the format, content and organization of information to be exchanged in any required list of documents as part of the discovery process. Principle 9: During the discovery process, parties should agree to or, if necessary, seek judicial direction on measures to protect privileges, privacy, trade secrets and other confidential information relating to the production of electronic documents and data. 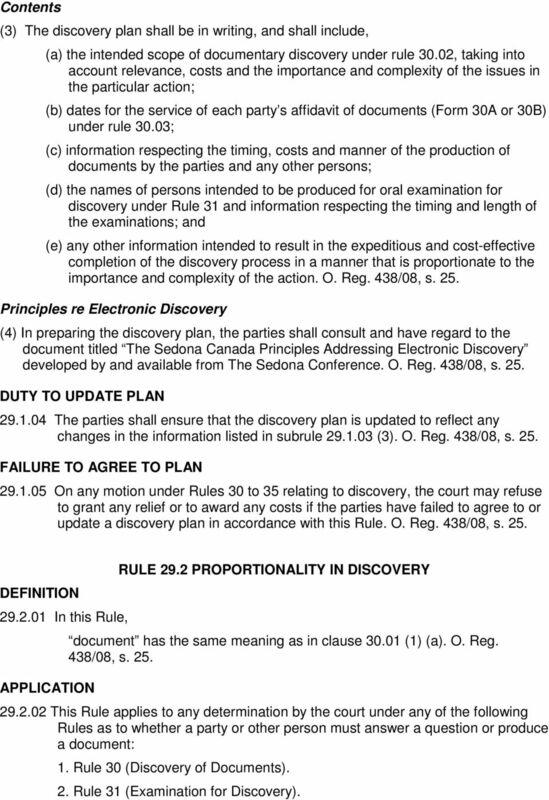 Proportionality Further, the e-discovery themes of proportionality, flexibility, and cooperation appear throughout the Sedona Canada Principles. 10 justifies the cost of acquiring that data. 14 A party refusing a request for further production must provide evidence that the requested source of electronic documents is not reasonably accessible because there is no relevant data on it, any relevant data on it is available in another, more accessible, location, or, based on sampling, there may be some relevant data on the requested source, but the cost to obtain it is greater than the value of the data. Sanctions and Other Forums Principle 11: Sanctions should be considered by the court where a party will be materially prejudiced by another party s failure to meet any obligation to preserve, collect, review or produce electronically stored information. The party in default may avoid sanctions if it demonstrates the failure was not intentional or reckless. Principle 10: During the discovery process, parties should anticipate and respect the rules of the forum in which the litigation takes place, while appreciating the impact any decisions may have in related actions in other forums. 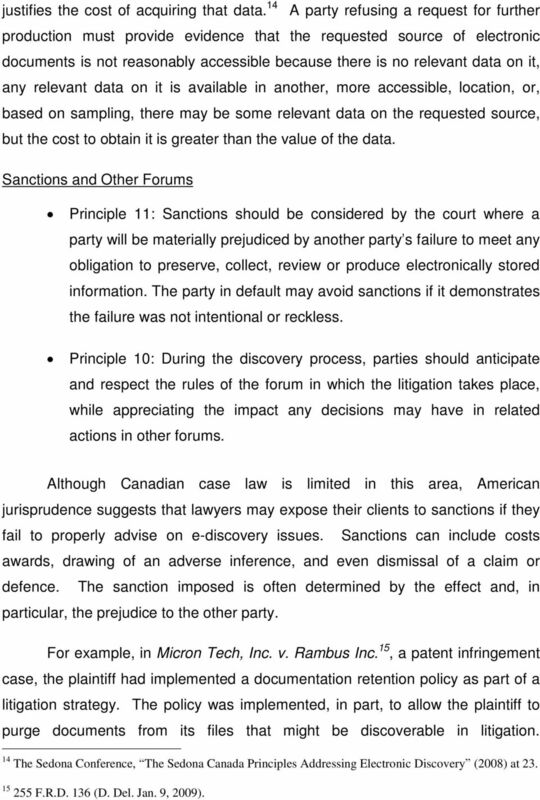 Although Canadian case law is limited in this area, American jurisprudence suggests that lawyers may expose their clients to sanctions if they fail to properly advise on e-discovery issues. Sanctions can include costs awards, drawing of an adverse inference, and even dismissal of a claim or defence. The sanction imposed is often determined by the effect and, in particular, the prejudice to the other party. For example, in Micron Tech, Inc. v. Rambus Inc. 15, a patent infringement case, the plaintiff had implemented a documentation retention policy as part of a litigation strategy. The policy was implemented, in part, to allow the plaintiff to purge documents from its files that might be discoverable in litigation. 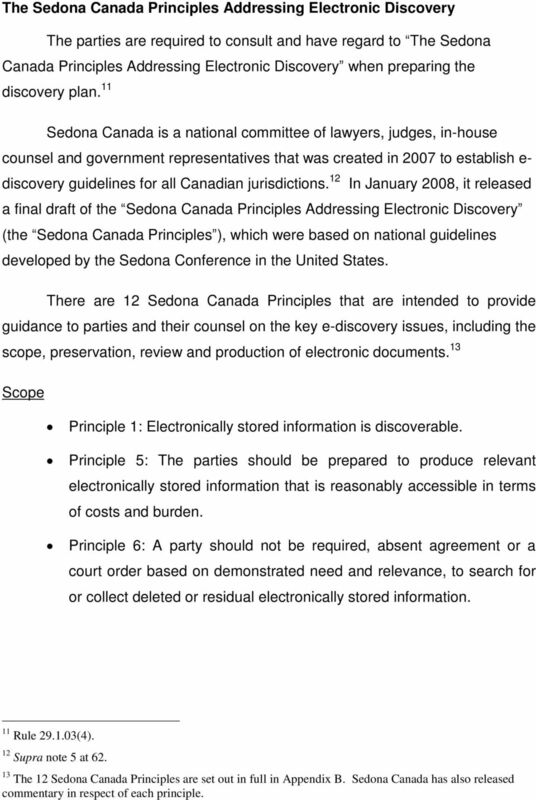 14 The Sedona Conference, The Sedona Canada Principles Addressing Electronic Discovery (2008) at F.R.D. 136 (D. Del. Jan. 9, 2009). 11 Employees were told to keep documents that strengthened the plaintiff s legal argument and to destroy anything that questioned its position. The court held that the document retention policy was implemented when litigation was reasonably foreseeable, even though no action had yet been started. The sanction imposed by the court was to declare that the subject patents were unenforceable against the defendant. In Atlantic Recording Corp. v. Howell 16, the plaintiff recording companies alleged that the defendant infringed their copyrights by using a file-sharing program to download and distribute their recordings. Following a court-ordered forensic examination, the court held that the defendant had, among other things, removed the file-sharing program after receiving notice of the lawsuit and used a program to permanently delete all traces of certain files from his computer. Because the defendant s actions made it impossible to decide the case on its merits, the court awarded the plaintiffs default judgment. Finally, lawyers may be exposing themselves to sanctions if they do not properly advise their clients on obligations related to e-discovery. In Green v. McClendon 17, the plaintiff commenced a breach of contract action against the purchaser of a piece of artwork. During documentary discovery, the defendant and her counsel repeatedly represented that they had conduced thorough searches and had produced everything in the defendant s possession. The defendant subsequently provided a hardcopy of a relevant spreadsheet and three electronic versions. The defendant also revealed that she arranged for her hard drive to be transferred onto compact discs and the operating system to be reinstalled after the action was launched, which breached the defendant s obligation to preserve all documents stored on her hard drive concerning the artwork in question. The court held that lawyers must take responsibility for ensuring that their clients conduct a comprehensive document search. The court highlighted that it was highly unlikely that counsel actually conducted a thorough WL (D. Ariz. Aug. 29, 2008) WL (S.D.N.Y. Aug. 13, 2009). 12 search for relevant documents as repeatedly represented. However, since there was no evidence that any of the destroyed documents would have been unfavourable to the defendant, the court declined to declare an adverse inference and instead awarded costs against the defendant and her lawyer. These cases are not raised to demonstrate the situations when sanctions will be considered in pursuant to the amendments to the Rules of Civil Procedure. For example, in the jurisdiction in which Green v. McClendon, supra, was heard, negligence is sufficient to trigger a spoliation finding. 18 By contrast, principle 11 of the Sedona Canada Principles allows a party in default of its obligations to avoid sanctions if it demonstrates the failure was no intentional or reckless. However, the American courts have a longer history of dealing with e- discovery and have confirmed that parties and their counsel ignore e-discovery obligations at their peril. Conclusion Through guidelines, principles and a few mandatory rules, the amendments to the Rules of Civil Procedure will introduce a new regime for e- discovery. Although this addition does not yet have the same rigid structure as other areas covered by the Rules, it represents the next step, albeit a tentative one, towards a full integration of e-discovery. 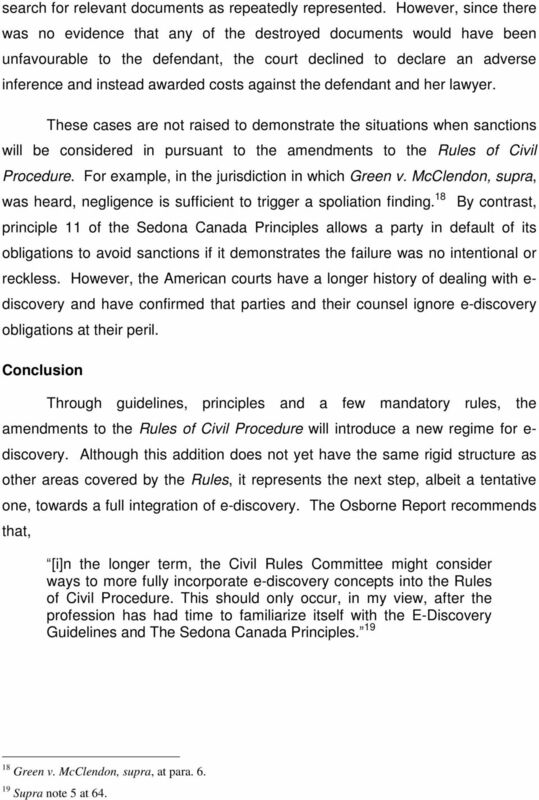 The Osborne Report recommends that, [i]n the longer term, the Civil Rules Committee might consider ways to more fully incorporate e-discovery concepts into the Rules of Civil Procedure. This should only occur, in my view, after the profession has had time to familiarize itself with the E-Discovery Guidelines and The Sedona Canada Principles Green v. McClendon, supra, at para Supra note 5 at 64. 13 APPENDIX A: AMENDMENTS TO THE RULES OF CIVIL PROCEDURE RELATED TO E-DISCOVERY INTERPRETATION Proportionality 1.04 (1.1) In applying these rules, the court shall make orders and give directions that are proportionate to the importance and complexity of the issues, and to the amount involved, in the proceeding. O. Reg. 438/08, s. 2. [ ] NON-APPLICATION OF RULE DISCOVERY RULE 29.1 DISCOVERY PLAN This Rule does not apply to parties who are subject to a discovery plan established by the court under clause (2) (d). O. Reg. 438/08, s. 25. DEFINITION In this Rule, DISCOVERY PLAN document has the same meaning as in clause (1) (a). O. Reg. 438/08, s. 25. Requirement for Plan (1) Where a party to an action intends to obtain evidence under any of the following Rules, the parties to the action shall agree to a discovery plan in accordance with this rule: Timing 1. Rule 30 (Discovery of Documents). 2. 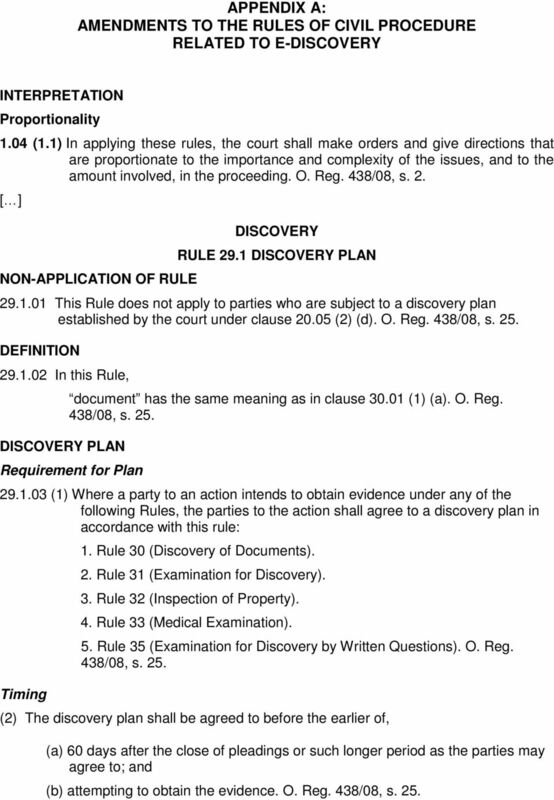 Rule 31 (Examination for Discovery). 3. Rule 32 (Inspection of Property). 4. Rule 33 (Medical Examination). 5. Rule 35 (Examination for Discovery by Written Questions). O. Reg. 438/08, s. 25. (2) The discovery plan shall be agreed to before the earlier of, (a) 60 days after the close of pleadings or such longer period as the parties may agree to; and (b) attempting to obtain the evidence. O. Reg. 438/08, s. 25. 14 Contents (3) The discovery plan shall be in writing, and shall include, (a) the intended scope of documentary discovery under rule 30.02, taking into account relevance, costs and the importance and complexity of the issues in the particular action; (b) dates for the service of each party s affidavit of documents (Form 30A or 30B) under rule 30.03; (c) information respecting the timing, costs and manner of the production of documents by the parties and any other persons; (d) the names of persons intended to be produced for oral examination for discovery under Rule 31 and information respecting the timing and length of the examinations; and (e) any other information intended to result in the expeditious and cost-effective completion of the discovery process in a manner that is proportionate to the importance and complexity of the action. O. Reg. 438/08, s. 25. 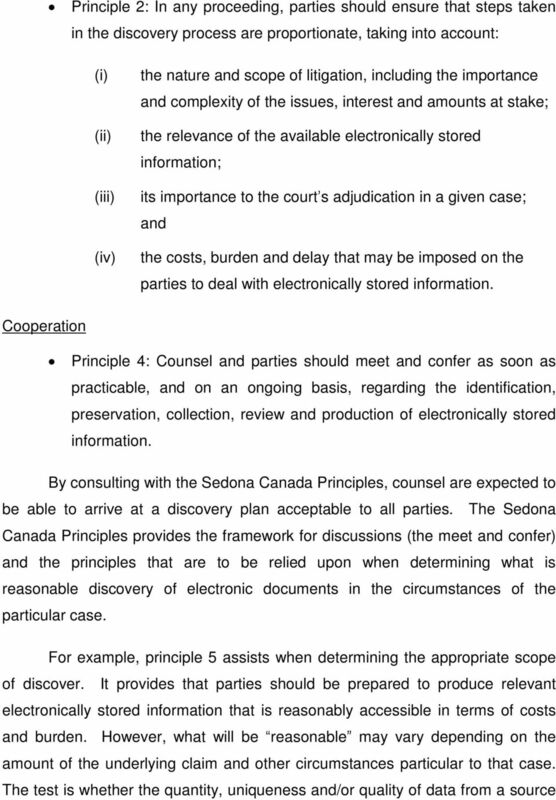 Principles re Electronic Discovery (4) In preparing the discovery plan, the parties shall consult and have regard to the document titled The Sedona Canada Principles Addressing Electronic Discovery developed by and available from The Sedona Conference. O. Reg. 438/08, s. 25. DUTY TO UPDATE PLAN The parties shall ensure that the discovery plan is updated to reflect any changes in the information listed in subrule (3). O. Reg. 438/08, s. 25. FAILURE TO AGREE TO PLAN On any motion under Rules 30 to 35 relating to discovery, the court may refuse to grant any relief or to award any costs if the parties have failed to agree to or update a discovery plan in accordance with this Rule. O. Reg. 438/08, s. 25. DEFINITION In this Rule, APPLICATION RULE 29.2 PROPORTIONALITY IN DISCOVERY document has the same meaning as in clause (1) (a). O. Reg. 438/08, s This Rule applies to any determination by the court under any of the following Rules as to whether a party or other person must answer a question or produce a document: 1. Rule 30 (Discovery of Documents). 2. 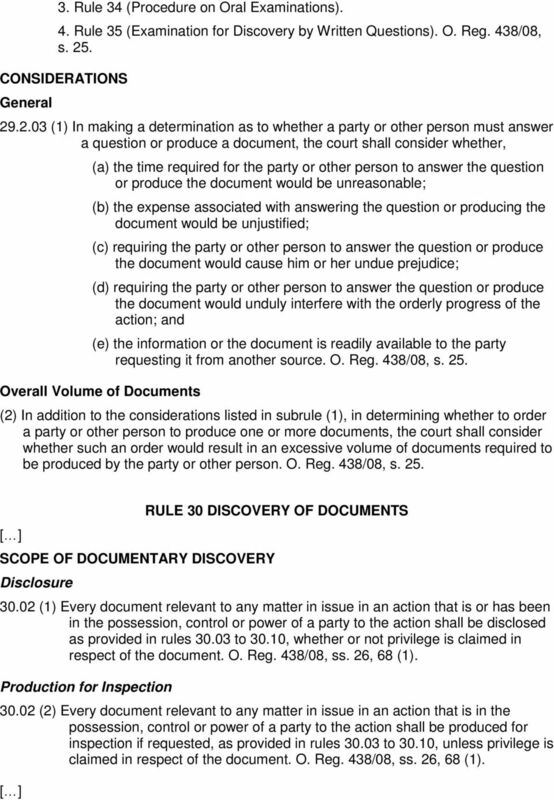 Rule 31 (Examination for Discovery). 16 AFFIDAVIT OF DOCUMENTS Party to Serve Affidavit (1) A party to an action shall serve on every other party an affidavit of documents (Form 30A or 30B) disclosing to the full extent of the party s knowledge, information and belief all documents relevant to any matter in issue in the action that are or have been in the party s possession, control or power. O. Reg. 438/08, s. 27 (1). 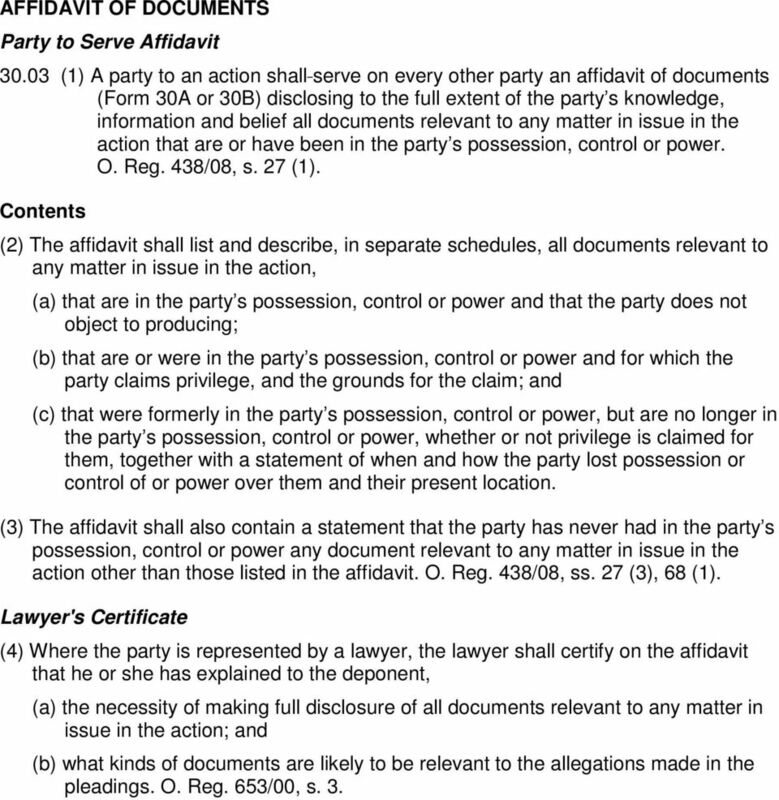 Contents (2) The affidavit shall list and describe, in separate schedules, all documents relevant to any matter in issue in the action, (a) that are in the party s possession, control or power and that the party does not object to producing; (b) that are or were in the party s possession, control or power and for which the party claims privilege, and the grounds for the claim; and (c) that were formerly in the party s possession, control or power, but are no longer in the party s possession, control or power, whether or not privilege is claimed for them, together with a statement of when and how the party lost possession or control of or power over them and their present location. (3) The affidavit shall also contain a statement that the party has never had in the party s possession, control or power any document relevant to any matter in issue in the action other than those listed in the affidavit. O. Reg. 438/08, ss. 27 (3), 68 (1). Lawyer's Certificate (4) Where the party is represented by a lawyer, the lawyer shall certify on the affidavit that he or she has explained to the deponent, (a) the necessity of making full disclosure of all documents relevant to any matter in issue in the action; and (b) what kinds of documents are likely to be relevant to the allegations made in the pleadings. O. Reg. 653/00, s. 3. 17 APPENDIX B: THE SEDONA CANADA PRINCIPLES 1. Electronically stored information is discoverable. 2. 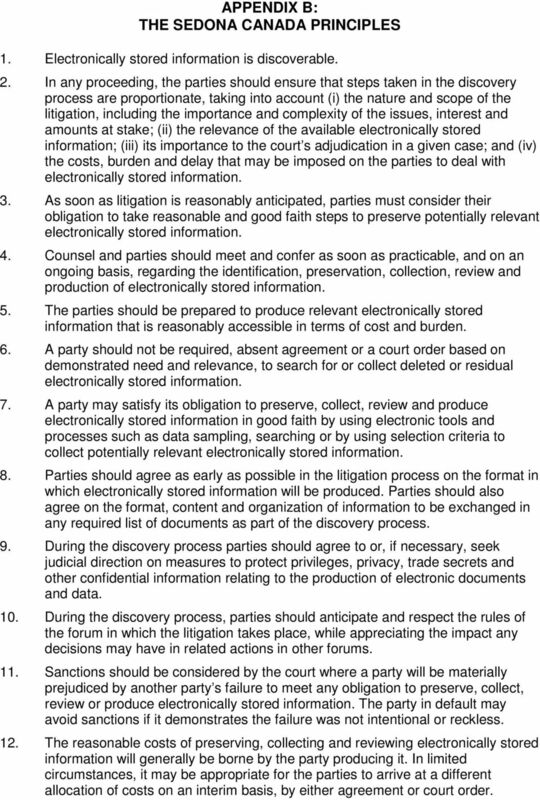 In any proceeding, the parties should ensure that steps taken in the discovery process are proportionate, taking into account (i) the nature and scope of the litigation, including the importance and complexity of the issues, interest and amounts at stake; (ii) the relevance of the available electronically stored information; (iii) its importance to the court s adjudication in a given case; and (iv) the costs, burden and delay that may be imposed on the parties to deal with electronically stored information. 3. As soon as litigation is reasonably anticipated, parties must consider their obligation to take reasonable and good faith steps to preserve potentially relevant electronically stored information. 4. Counsel and parties should meet and confer as soon as practicable, and on an ongoing basis, regarding the identification, preservation, collection, review and production of electronically stored information. 5. The parties should be prepared to produce relevant electronically stored information that is reasonably accessible in terms of cost and burden. 6. A party should not be required, absent agreement or a court order based on demonstrated need and relevance, to search for or collect deleted or residual electronically stored information. 7. A party may satisfy its obligation to preserve, collect, review and produce electronically stored information in good faith by using electronic tools and processes such as data sampling, searching or by using selection criteria to collect potentially relevant electronically stored information. 8. Parties should agree as early as possible in the litigation process on the format in which electronically stored information will be produced. Parties should also agree on the format, content and organization of information to be exchanged in any required list of documents as part of the discovery process. 9. During the discovery process parties should agree to or, if necessary, seek judicial direction on measures to protect privileges, privacy, trade secrets and other confidential information relating to the production of electronic documents and data. 10. During the discovery process, parties should anticipate and respect the rules of the forum in which the litigation takes place, while appreciating the impact any decisions may have in related actions in other forums. 11. Sanctions should be considered by the court where a party will be materially prejudiced by another party s failure to meet any obligation to preserve, collect, review or produce electronically stored information. The party in default may avoid sanctions if it demonstrates the failure was not intentional or reckless. 12. The reasonable costs of preserving, collecting and reviewing electronically stored information will generally be borne by the party producing it. In limited circumstances, it may be appropriate for the parties to arrive at a different allocation of costs on an interim basis, by either agreement or court order. The Road to E-Discovery: More Garden Path, Less Mountain Climb? Federal Rule Changes Affecting E-Discovery Are Almost Here - Are You Ready This Time? Set out below are our comments, which are quite minor, on each of the specific guidelines. 12 May 2014. Professor Barbara McDonald Commissioner Australian Law Reform Commission GPO Box 3708 Sydney NSW 2001. By Email to: info@alrc.gov. Supreme Court Rule 201. General Discovery Provisions. (a) Discovery Methods. IN THE SUPREME COURT OF THE STATE OF DELAWARE JAMES HILL, JR., No. 381, 2011 Plaintiff Below, Appellant, Court Below: Superior Court v. of the State of Delaware, in and for New Castle County RICHARD P.